As we say, the supreme force of network promotes connectivity among people at every comer of the globe. We may not enjoy its convenience or gain knowledge as we want it easily and casually but, we would all agree that a secure network is a must. And a secure network can be achieved by blocking certain servers manually. This method is known as the Network Access Control List. What is Access Control List (ACL)? Access Control List or ACL is an additional layer of security for your Amazon Virtual Private Cloud. Access Control List acts as a firewall for controlling ingress and egress traffic of one or more subnets. You can set up your ACL rules similar to your Security Groups. Remember, security groups and access control list are two different things because AWS Network ACLs are stateless, unlike security groups which are stateful. In simple words, changes in incoming rules will not be applicable to the outgoing rule in the access control list. For example, if you want to change the port of communication of your instances then you have to add an inbound as well as an outbound rule. 1. When you create your VPC, it comes with a modifiable default Network Access Control List. And by default, it allows all inbound and outbound IPv4 and IPv6 (if applicable) traffic. 2. You can create your custom network ACL and associate it with a subnet. And by default, each custom ACL rejects all inbound and outbound traffic until you add rules. 3. Each of the VPC subnets must be associated with a network ACL. If you don’t associate the subnet with network ACL explicitly, it will associate your subnet with default ACL automatically. 4. A subnet can be associated only with one ACL at a time; however, an ACL can be associated with more than one subnet. Why you should create a CloudWatch alarm for Network Access Control List changes? Network Access Control List provides you with an additional layer of protection for your AWS virtual private cloud. Creating CloudWatch alarms to detect any configuration changes in the Network Access Control List will help you prevent unexpected alteration in the inbound and/or outbound traffic rule which may lead to unrestricted access and increase the opportunities for Distributed Denial of Service (DDoS) attacks. A CloudWatch alarm is triggered each time a Network Access Control List (NACL) configuration change is made. Every time when an AWS API call is performed to create, update or delete a Network ACL, CloudWatch alarm must notify you. Supervision of Centilytics becomes more important since it checks for the CloudWatch alarm required to be set up in your AWS account and lists down all the accounts in which the alarm have not been enabled. 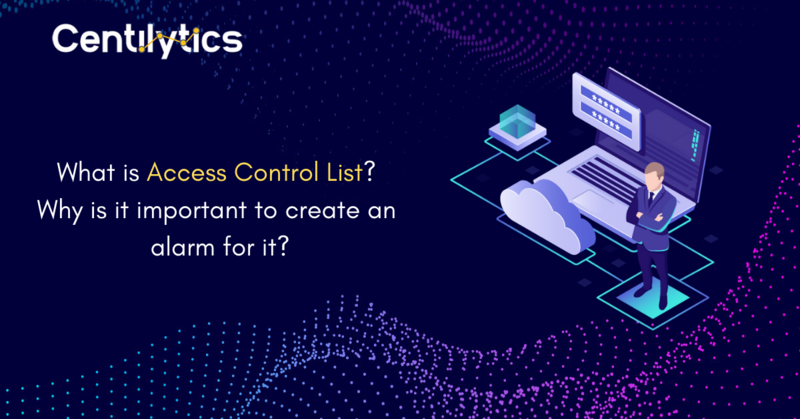 With our applicable filters and pigeonholing into categories, it becomes easier to understand the configuration of the Network Access Control List. Ok: Following trail has CW logs groups configured with metric filter, alarm, SNS topic with at least one subscriber. Custom Severity Description: Shows the severity of your metric filter and its functions’ custom description. Resource Tags Value Applying resource tags value filter will display data which will have the selected resource tag value. For e.g. – Let’s say a user has tagged some resource by a tag named environment and has a value say production (environment: production). Hence, the user can view data of all the resources which are tagged as “environment: production”. The user can use the tag value filter only when a tag name has been provided. Compliance Applying the Compliance filter, you can further refine your security and health checks.